The Late Professor Nandadasa Kodagoda was born on 31st October 1929 in Hikkaduwa and grew up in the village of Ahangama in the Southern Province of Sri Lanka. He received his early education at the Ahangama Temple School. After the first two years of education, he was admitted to Nalanda Vidyalaya, Colombo. Nandadasa’s parents took him back to the Galle district, and admitted him to Mahinda Vidyalaya in Galle during the World War ii period. Nandadasa completed his secondary education at Mahinda Vidyalaya and having passed the University Entrance Examination, entered the Faculty of Medicine of the University of Colombo. After obtaining the degree of Bachelor of Medicine and Bachelor of Surgery in 1956, he joined the Health Department and was attached to the government hospitals in Galle, Colombo & Karawanella. In 1959, he joined the Faculty of Medicine as a Lecturer in Forensic Medicine. Dr. Kodagoda obtained the Diploma in Medical Jurisprudence from the University of Edinburgh and the Membership of the Royal College of Physicians. Subsequently, the Royal College of Physicians conferred its Fellowship on Dr. Kodagoda in the year 1973. Dr. Kodagoda obtained the degree of Doctor of Medicine from the University of Sri Lanka. Dr. Kodagoda having served the University of Colombo as a Lecturer, Senior Lecturer and Associate Professor, was subsequently appointed as Professor of Forensic Medicine in November, 1985. 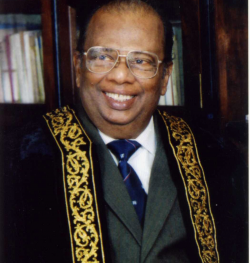 Prof. Kodagoda was elected as the Dean of the Faculty of Medicine in 1988. It was during his second term of office as the Dean, that he was appointed the Vice-Chancellor of the University of Colombo in the year 1994. Prof. Kodagoda was the Chairman of the National Dangerous Drugs Control Board and the Founder Chairman of the Alcohol & Drugs Information (ADIC) Center. Prof. Kodagoda took a keen interest in health education and popularising science by handling the media dexterously and innovatively and wrote widely and extensively. It was in recognition of his work and service to Mother Lanka, that the title of “Deshamanya” was bestowed on him by Her Excellency the President in 1994. He was also conferred the title of “Visva Prasadini” by the Hon. Prime Minister in 1996. Prof. Kodagoda was also awarded the prestigious title “Kala Keerthi”, a fitting honour in acknowledgement of his versatility and outstanding contribution in the spheres of Arts and Culture. Prof. Kodagoda was a highly recognized academic and a professional of repute, respected and renowned in many parts of the world. The University of Colombo in recognition of his contributions in diverse fields, to the University of Colombo in particular and the Sri Lankan society in general, conferred the Degree of Doctor of Science (Honoris Causa) in the year 1996.